Turtles: They hide if you get close enough and like sugar cane. Armadillos: They hide if you get close enough and like seeds. Horses: You can tame them with wheat (Creamy, Black, Brown, Grey, Mule, Donkey and Zebra) or apples (White and Chesnut), and depending on their type is their speed and jump level. You can craft Horses Armors, including the new Emerald Armor! Ostriches: Males are aggressive, females are passives, and if you hit them they drop eggs, which you can use to get your own ostrich. Goats: They eat dropped items, grass, bushes and flowers. Elephants: There are two types of elephants. You can tame them with Sugar Lump. The light grey is an African elephant and the dark grey an Asian elephant. The African elephant can be used as a bulldozer when riding it. Rabbits: There are three types, the white killer is hostile. The normal ones and the third type is the Creebbit, a green friendly rabbit. It drops gunpowder if u hit him, and will explode if you kill it. You can turn the green rabbit into a non-explosive rabbit by hitting it with a hoe tool. Lions and Tigers: You can tame little one with meat or porkchop (using porkchop gives you a greater chance of taming), but not the big ones. You can use a whip to make the lion follow or stop following you. Fish: You can craft tanks to capture them and decorate your home. 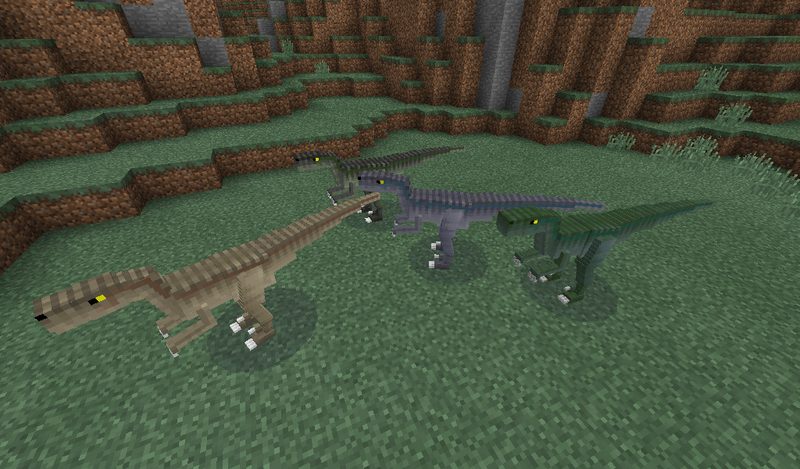 Velociraptors: You can only get from the creative mode. Chameleons: They camouflage!and follow if you have seeds..
Snakes: Some are more poisonous than others but do not play with them. Stingrays, Jellyfishes, Eels and Blowfish: They are poisonous animals. White Shark: Run! or Swim! fast. Moles: They make holes if you get close enough. Tame with sugar cane. Seals and Penguins: They like to swim! Seals slide on ice..
Roadrunner, Squirrels, Lizards and Deers: They run away from you.